For years, Buncombe County teachers were requesting more nonfiction texts for their classrooms. Simultaneously, district leaders were unimpressed with much of the available material -- most of it textbooks, which were expensive, lacking capabilities for tracking engagement, and unable to accommodate a range of reading levels or topics of interest. 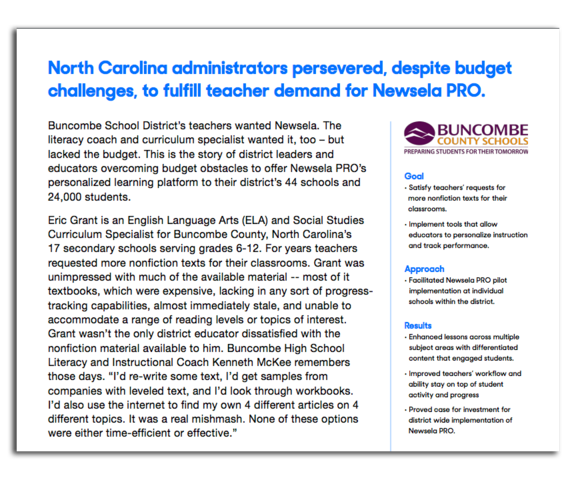 This is the story of district leaders coming together with school leaders to overcome budget obstacles to provide teachers with Newsela PRO across 44 schools and 24,000 students. Enhanced lessons across multiple subject areas with differentiated content that engaged students. Proved case for investment for district wide implementation of Newsela PRO.